Photos from "Rudolph & Company"
Since the start of the year 2002 the Documentationarchive of the Austrian Resistance is offering a new service to its users. 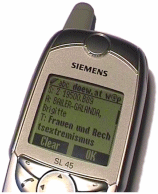 It is now possible to query the digital library of the DOeW using a WAP-enabled mobile phone or pda. This new way of accessing the database is useful especially for students and researchers who are working in other libraries and archives where they are not directly connected to the Internet. They may use their WAP-browser for an immediate search for related and referred work. Like its other Internet-services and the use of the archive and library, the DOeW offers the search via WAP for free (known connection fees may be charged by the mobile phone company). The librarian of the DOeW is maintaining the digital index since 1995. Records of the old card index are continuously added. In addition to the listing of the books and magazines, a number of descriptions of important single articles has been stored in the database. At the moment it contains more than 17000 records. The "doew.at w@p"-service has been implemented by M-IT to demonstrate an useful application of mobile information technology.